March 2011 update. 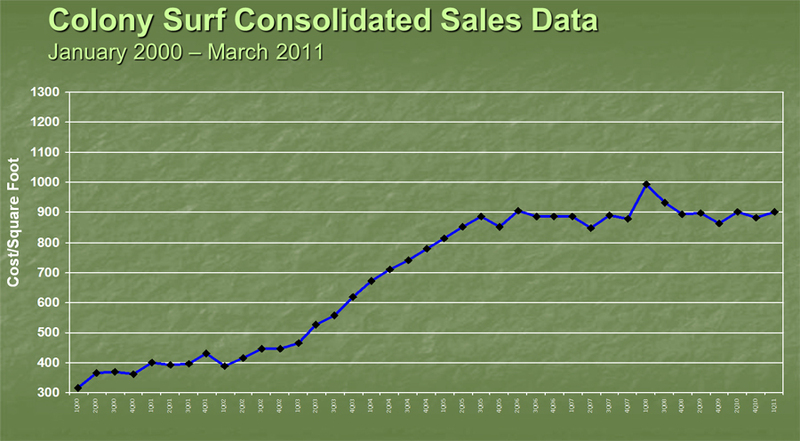 Colony Surf has mostly escaped the downturn of the broader Oahu real estate market with price per square foot remaining fairly stable for the past few years. The ups and downs are attributed to exceptional sales; either up or down. The largest blip was skewed by a single record-setting sale of a combo unit that was extraordinarily renovated. While unit sales volumes have begun to increase in recent quarters, there are still noticibly fewer sales compared to earlier in the decade. This makes trend data more art than science. With fewer sales, data is effected by single abnormal sales (condition and location have greater influence) that will skew data in some quarters. On the upside, Colony Surf has proven to be a good investment for longer term owners -- especially those original owners who paid less than $20,000 for their units! I also know that there aren't any new ocean front buildings being built, so Colony Surf and the rest of the "Gold Coast" will continue to offer a relatively scarce commodity. Add in the option of short-term (30+ day) leases and fee-simple ownership and Colony Surf makes sense (however, as an owner, I'm completely biased). Originally I broke the building into four reporting areas because there was enough price difference to warrant it. As the real estate boom/bubble hit its height, those destinctions became less valid as costs per square foot for all unit types equalized (the exception being floors 1-3 on the side of the building (limited views always place them well below the building average) . However as Oahu and the Colony Surf continue to shake off the effects of the bubble, these price destinctions are beginning to reassert themselves -- location and unit condition matter more. Whether this is a long-term trend or another market "blip" no one can say. Methodology: This graph is a combination of art and science. Given the finite number of units in each category, average square foot prices were approximated when there were no sales of a particular type in a given period. For example, there are just 15 ocean view units on floors 1-3 on the side of the building. There are large gaps in time between sales.